The anticipation of a new ride…you search the internet, MTBR trail review, the forums, and MTB Joe’s personal site looking for info about the new trail. I heard about F.I.N.S. after reading about a group ride on MTBAZ.net, aka: Kristi’s rides. That’s where my fascination with FINS began. Living on the east side, I don’t get many chances to head out west to ride so it took a few months for the opportunity to partake of the new singletrack. I set out for an evening ride armed with a couple of maps, a Google Earth layout of the land, 100 oz. in the HAWG and the quest for adventure. First impressions. These trails are loads of fun. I rode for 13 miles, cruising through nearly the entire system. The north/east loops are fast, with moderate climbs and lots of twisting and turning. They are all fairly short and you can ride them up and down all you want. I especially liked Harv’s Howl, Hurt’s Donut, and Boneyard. For me the best of FINS though is Grunt trail and the new section that traverses the length of the mountain up to Jim’s Ascent. Definitely the most technical riding on the Island with some decent exposure and climbing to satisfy the uphiller in me. Bottom line: FINS is an XC riders paradise. If your tastes are more geared for National, Mormon, Geronimo, Holbert, Corona Loma, you won’t find much challenge on FINS but you surely could have fun. If you’re a weekend warrior and frequent Hawes, Usery, Casa Grande Mountain, or the race loops at McDowell, FINS is for you. FINS is built on private land in the Estrella Mountain Ranch development. There have been a lot of questions about its legality the past few years. Although it’s not an official trail system, I’ve never heard of any trouble with the land owners. There is no doubt the land will be developed soon. How soon? I saw flags marking new lots out near the north/east loops. If I were you I’d get out and ride FINS before the bikers are booted off the Island. Developers are there, the land is parceled, flags are drawn. It’s very likely that these trails will be gone or at least shortened soon and some awesome riding will be history. My advice: Ride ’em while you got ’em! Thanks to Harv and all the other locals who built the system. They group ride on Thursday evenings if you want a grand tour of this Island paradise. If you’re going to ride solo Harv suggests parking at Westar Elementary School and riding to trailhead about 1/2 mile. Left turn off the sidewalk where the left turn lane turns in to a roadblock. See Picasa photo album for a shot of the TH. From a novices perspective I can honestly say I was a little intimidated. Especially when I got to a sign that read expert riders only. Took the plunge and had a blast!! I did ride the brakes a little and took it slow but was a lot of fun. I expect to go back soon. Still open and great riding. This thread is pretty out dated but I’m planning on heading the 2 3/4 hour trip up here from Yuma to hit FINS this weekend. Is this place still open? I saw several comments about arrests, closures, and possible builder construction sites. Any news would be great and appreciated. Thanks! I ride these trails every week and I absolutely love them. Whoever built this place is my hero. Great trails. I have my own bmx and mtb track in my backyard and I am a great builder. Would like to meet up with some people who work on the track and give them a hand and ride with some new people too. I usually ride alone witch is fun but of course some company would be even better. We rode FINS for the first time last weekend. This place did not disappoint. It was all single track. Trails are all signed with skill level. We stayed on the outside loop mostly. Sure seemed like these trails were designed by mountain bikers because they were all a blast. Lots of technical spots, not really a beginners trail system but not expert either. The uphills that we rode were short and fun. Not much for downhillers, but they do have a sweet short trail with wood ramps and berms. Lots of short trails with options. This was my favorite place to ride in the valley and worth the trip. I live in south-west Phoenix and so this trail is somewhat close. I still consider myself to be a beginner, but not to the point of being deterred by difficulty. I find FINS to be the best (and really the only) trail in south-west Phoenix that was intended for mountain bikes. There is the competitive track at Estrella PIR but I feel that is geared towards the more determined riders (i.e. less fun). From what I have seen so far FINS offers a little bit of everything. Parked at Westar Elementary but there is parking at the trail head. All of the riders I encountered seemed helpful. The cool looking maps are another great thing about the trail. What else can I say, it is worth a 50 mile drive for a day of fun. If you are lucky enough to live close by, I am jealous. Thanks Greg. Whats the riding like in Michigan? Gald to see you riding the trails again. Missed the Phoenix photos and stories. U are always welcome to see Michigan in the summer. Open invite!! I rode this today for the first time and had an absolute blast! do these guys still meet and bike FINS every thursday? Yes Fins is open. There have been some trail closures in and near Estrella Mountain park, but ride FINS! Is FINS still open? I saw a post that people are be arrested for trespass. Has anyone been there lately? Rode FINS with my friends Monday, November 21, 2011. Lost my cell phone, it was in a black leather case. If any of you riders find it..I would greatly appreciate it if you would post on here letting me know, or pull up the phone info and call the phone’s number. I have shut the service off, so you can call my new (hopefully temporary) phone at my old phone number. I really would like my phone back, it has a lot of pictures of my children. Thanks, Heather PS FINS was so much fun!!! Thanks Mike, you’ve been on vacation from the blog. I plan on riding these trails this Saturday morning 7/16/2011. I assume they still exist and that the entry point is the same? The Google maps Sat photo still showed it intact. Great trail.Love the jumps and not to long or to short. All you mountain bikers on the west side come to American Made Rideshop out here in goodyear we have Great in and out service. get 20% off on all parts if you mention where you saw this add. Glad you had a great time FYAZZIE. FINS truly is a great place to play. Thanks for the comments! I finaly got a chance to go out to FINS. After hearing alot of good things about the trail, so i dicided to check it out for myself and ive got to say that it is an amazing single track. several different options. i spent the day riding every trail that was there,. rode all the decents and some of the climbs. great trail system. Have and the crew used to Ride on Thursday evenings during the summer. I’m not sure when they ride in the winter. I’ll see if I can find out from Harv and I’ll post up. What is the meeting time for the Tuesday group (if they still meet)? I have been riding FINS recently and love the layout. There is a lot of good single track and mtn climbs. The only note that I would like to add to the map is… the correct way enter Grunt is via Rusty Rake then through Jims Star Pass. Thanks to the good people at Estrella Mountain Cyclery i found this phenomenal trail. It is well maintained, has helpfull signs and is a blast to ride. Development is inevitable, and i hate to see this trail comprimised, so ill go out there evry day to fullfill my addiction. Awesome singletrack!!!! I found it by accident about a year ago and have been riding it whenever possible ever since. It is by far the best riding in the west valley. Novice may have some trouble. The trail is fast and fun with a great rhythm to it. The ” grunt ” trail is not for the faint of heart as there is a lot of exposure and some loose dirt. However, after you make it to the top, any trail you choose will be a great ride down!!!! i discovered the trails totally by accident one day while riding around the area (it turns out i live about 5 minutes from the trail head). what a great find and big kudos to the developers and maintainers of the trails. i do a lot of work from home and it’s the best thing ever to hop on my bike and spend some desert time on these trails. i’m a total novice, but there’s plenty of sane trails to keep me busy. I’m not sure Lee. That’s a question only Harv can answer. 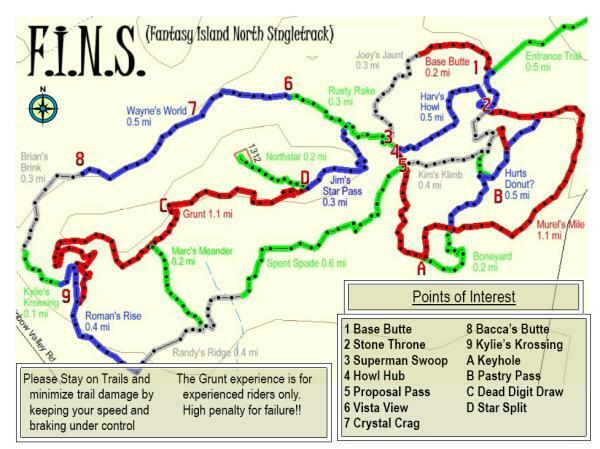 But I think the colors represent the different names of each trail segment. It can’t be difficulty, since Grunt and Murel’s Mile are both red. Grunt is much more technical than any of the other reds. What are the different colors on the map to represent? Yes FINS is a great play ground. I have been riding there for 2 years and never board with the layout. 99% of the trails can be ridden ether direction except Donut if your good even it can be done backwards. the Tuesday Night Group Rides are a blast.you if like climimg take Jim’s Starpass up to to the North Shore Summit. at the top there is a nice 360 view of the area. then turn down for a hair raising desent with optional jumps on the way down. I rode this trail for the first time the other week and its easily my mostly enjoyable riding experience west of Phoenix. Even the drive down was pretty good! I’m hoping to get up in time for an early start there tomorrow too. I plan on taking plenty of water for lots of exploring to get to know the trails some more. i rode this bundle of trails last winter and had a blast! like you said, not the most techinal, but we spent a good 4 hours out there just exploring – thanks for the review, this site is a blessing! WOW! These are possibly the best trails in the valley! There are a couple of small jumps, excellent trail signs, smooth rock gardens, and lots of beautiful rolling hills! I can’t wait to go back! Glad you found my review Harv. Drop me an email or make a comment when you hear news on the trails. Long live FINS! Nice – looking web-page too. The rider dropping in / off that chunk of “North-Star” is David. Will tell more on the legality / longevity of FINS when I/we know more. * A good friend sent this link to me and this made my day! Rode this trail for the first time on 11/18/07 and loved it. As you make your way out to the main system of trails, you pass by two small 1 foot jumps. Kinda fun to warm up on. The trails are well marked with degrees of difficulty. Most trails if not all are very narrow and tight in certain places. The trails are lined with cactus everywhere so be careful to not go too fast on the way out and loose it. From the trailhead, it’s all up hill – some gradual, some steep. However, there’s a lot of switch backs, some medium rocks and minor technical stuff to overcome which make the trail fun. There’s some loose dirt and rocks along the way, especially on some of the climbs near edges – but that’s totally expected, this is Arizona. However, if you’re a novice, you might want to take it slow, especially on the way back. Overall, this trail is great for the entire family of all ages and I expect to be back weekly. This trail Rocks. Best in the West Valley!